Trigonometric functions are special in several ways. The first characteristic that separates them from all the other types of functions is that input values are always angle measures. You input an angle measure, and the output is some real number. The angle measures can be in degrees or radians — a degree being one-360th of a slice of a circle, and a radian being about one-sixth of a circle. Each type has its place and use in the study of trigonometry. Another special feature of trig functions is their periodicity; the function values repeat over and over and over, infinitely. This predictability works well with many types of physical phenomena, so trigonometric functions serve as models for many naturally occurring observations. 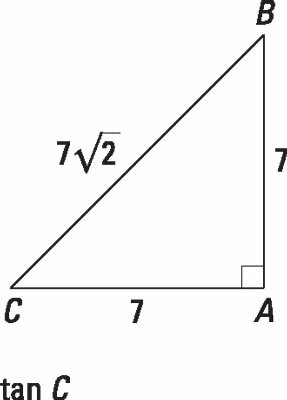 Use the triangle to find the trig ratio. Solve the problem. Round your answer to the nearest tenth. Jase is in a hot air balloon that is 600 feet above the ground, where he can see his brother Willie. 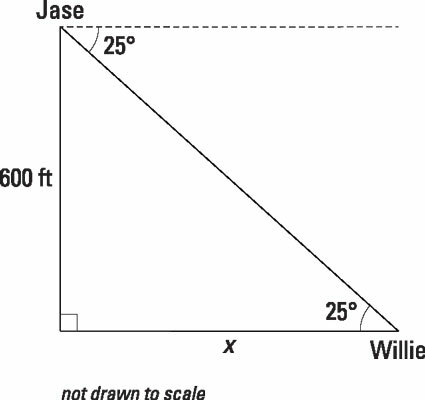 The angle of depression from Jase’s line of sight to Willie is 25 degrees. How far is Willie from the point on the ground directly below the hot air balloon? The diagram shows the situation. The angle of depression is outside the triangle. However, the angle of depression is defined as the angle between a horizontal line and the observer’s line of sight. The horizontal line is parallel to the ground, so the angle of depression is equal to the angle formed by the line of sight and the ground. Willie is about 1,286.7 feet from the point on the ground directly below the hot air balloon.